Soft, Comfortable, and Affordable, the Better Life Ostomy Belt is the perfect Ostomy support solution for concealing, protecting and supporting your Ostomy Pouch. Hide and support your Colostomy or Ileostomy pouch while you enjoy all of life's activities with this soft, lightweight, and durable pouch cover. Made in the USA and assembled with materials carefully selected to provide long-lasting comfort and durability, Ostomy Solutions’ Better Life Ostomy Belt is an ostomy support garment that is economical and easy to care for; you simply machine wash and dry and wear it again and again. The Ostomy Solutions Better Life Ostomy Belt is relied on daily by thousands of satisfied customers who consider it an essential article of clothing and part of their ostomy equipment. A soft layer of fabric isolates your skin from the plastic of your pouch and clip, and another soft layer of fabric covers your pouch, making the Better Life Ostomy Belt ideal for intimate wear. Feel great about your appearance, wear your clothes normally, and enjoy an active lifestyle with renewed comfort and confidence. The Better Life Ostomy Belt is soft, it's breathable, and it's so comfortable that you won't even be aware that you are wearing it. Our ostomy support garment is worn along with your present ostomy pouch and is compatible with ostomy appliances from all manufacturers. 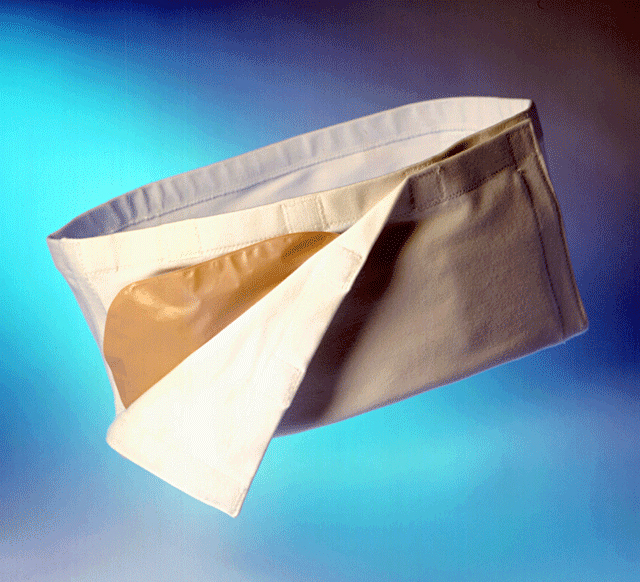 Adaptable for either right side or left side stoma locations, it can be used with both one or two-piece ostomy pouches. As you will notice in the picture above, you will be wearing your pouch attached in a horizontal position while wearing the Better Life Ostomy Belt. Although you now wear your pouch hanging down in a vertical position we find that that this works just fine. Think of it this way; you spend approximately one-third of your day resting or sleeping during which time your pouch is not in that vertical position yet is still functional. The key is to not allow the pressure of the filling contents of the pouch to build so much as to compromise your pouch seal, resulting in leakage. While wearing the Better Life Ostomy Belt your pouch is completely enclosed within the pocket area of the belt, supporting the weight of the pouch as it is fills. The material enclosing the pouch within the pocket is very stretchy and allows the pouch to expand without restriction. Restriction to the filling pouch will mostly come from the clothes you are wearing and that occurs whether the pouch is horizontal or vertical. Just empty your pouch when it is about one-third full as is normally recommended. The Ostomy Solutions Better Life Ostomy Belt does not have to be removed to access your pouch to empty, and when you remove the end of your pouch from the pocket of the belt and point downward to empty, you will find that it reaches down almost as far as when your pouch is worn vertically. Try it! Feel great about your appearance and participate in all of life's activities. You won't know how you ever got along without it! Get it soon! Better Life Ostomy Belts are in stock for fast delivery. Orders are usually shipped within 24 hours. We use U.S.P.S. Priority Mail for 2-3 day delivery within the United States, and Priority Mail International for International delivery normally within 6-10 days.